Concept Landscaping is a full service landscaping company, specializing in hillside landscaping and shoreline erosion control. Concept offers a full barge service on Lake Minnetonka, which allows them to access your shoreline and lakeside landscaping from the water with equipment and supplies. In addition to specialized lakeshore work, Concept also offers full yard landscaping. Whatever your project entails, Concept will find a way to see it to completion in a clean and professional manner. 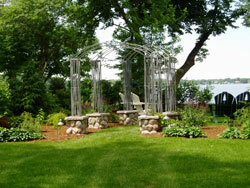 As a larger landscaping company, Concept is able to concentrate on a wide array of diverse installation practices. Concept currently has 4 crews, each with unique, fine tuned experience characteristics. With Concept's refined specialized skill sets, your project will become a masterpiece. For exceptional erosion control and landscaping services, please call us at 952.472.4118 and we'll readily address your needs. We work along Lake Minnetonka. Our service area includes, but is not limited to, Mound, Minnetrista, Shorewood, Excelsior, Wayzata, Deephaven, Tonka Bay & Orono, Minnesota.